Hillary Clinton’s campaign says the Democratic presidential nominee was diagnosed with pneumonia on Friday, citing that as one reason why she collapsed after leaving during the 9/11 memorial in New York City. After the collapse, she went to her daughter Chelsea Clinton’s apartment, as a spokesperson for the campaign said that she played with her two grandchildren and visited with her daughter. It is unclear why Clinton decided to visit her daughter and grandchildren, despite later saying she has a disease which can be contagious. 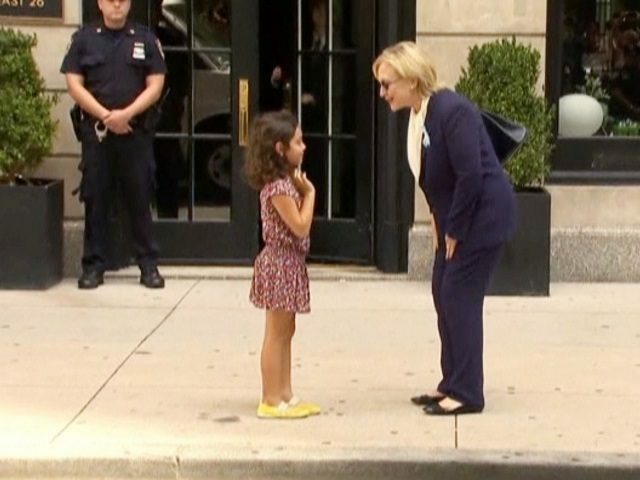 After leaving the apartment, Clinton was filmed hugging a small child before leaving for her home in Chappaqua, NY. When reporters asked her what happened, she shrugged. Her campaign is saying some of them got it, too. Speaking of unwell, how's Breitbart doing these days? LMAO you girls are in a tizzy today. Don't use "girls" as a pejorative. Your medical expertise is noted. She's looking for the sympathy vote, and now one of her inner circle people without realizing it let the cat out of the bag. 5. Her campaign is saying some of them got it, too. So it must be the contagious form. 14. Parkinsons ,thats my opinion..
6. Speaking of unwell, how's Breitbart doing these days? Oh, that's right . . . he's DEAD. My bad. 8. LMAO you girls are in a tizzy today. 9. Don't use "girls" as a pejorative. Your next president is going to be a girl. 16. Really? Someone replacing Hillary? What a fucked up memorial that is. Also, since it appears to be a grave marker rather than an inscription on a sarcophagus, what's the "herein"? "Herein" the Earth? Well, many actually great men are interred in the Earth somewhere, though that bozo is surely not one of them. You served on a randomly-selected Jury of Discussionist members which reviewed this post. The review was completed at Mon Sep 12, 2016, 12:52 PM, and the Jury voted 2-5 to LEAVE IT. Explanation: Yes, this post is over the top. There is a response to this post by Zutak which is also inappropriate. If I could, I would vote to hide both. 7. Your medical expertise is noted. You have no idea whatsoever what medical advice she received about the current communicability of her illness.